Never attempt this activity. You will destroy your car and surely bring death or dismemberment upon yourself, your loved ones and your pets. I offer this information only for academic purposes, and am compelled to warn you that even viewing it could put you in mortal danger. You assume all risk after reading beyond this line. I won't kid you, there are parts of this that can be pretty tough. I have new respect for the upholstery guys now! My finger tips are raw, but I'm getting it done! This isn't so much a "how to" as just providing some reference and ideas for the project. I removed all hog rings that I encountered, and replaced them with zip-ties. I kept forgetting one thing or another, and had to cut out my zip-ties and start over. I think I STILL forgot the upper clips in the seat back! Lumbar bladders are made by Rostra. Heaters purchased at Cartek. Great folks to deal with. They helped me out when I had an issue years after installation. 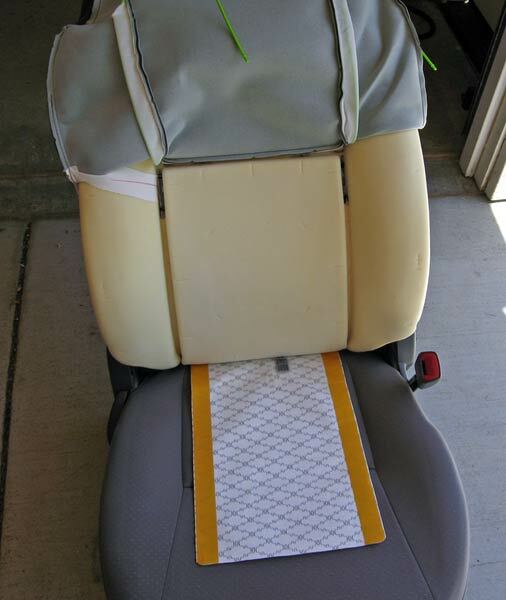 I first yanked the passenger seat out, and put it over an angled support table with a blanket thrown over. This worked out really well! The passenger seat will only get heat, so I thought this would be the easy one to start with. Plus I can still drive the car if I screw this one up. 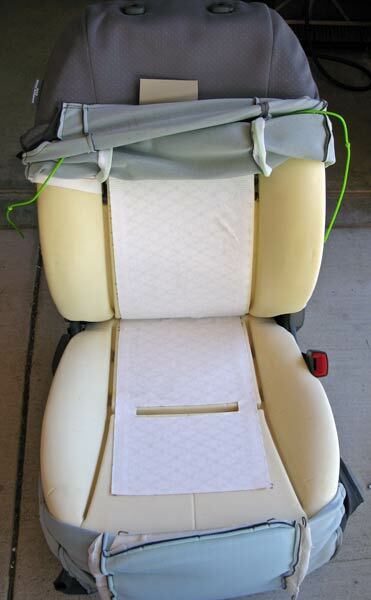 ;) Use 14mm socket to remove seat, and unplug all the harnesses by tilting the seat back a bit. Push seat all the way back on the track before pulling it out of the vehicle - otherwise it is a tough fit through the door! 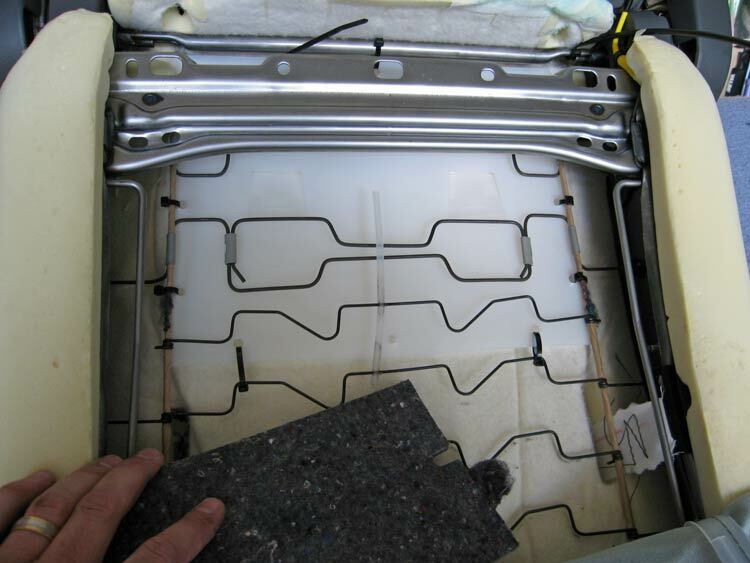 Pulled the back cover up and prepared the heater pad for installation on the back. I sprayed the entire surface (only the pad surface, not the foam) *lightly* with 3M-77 Adhesive spray so it would be tacky all over, instead of just on the side strips. Before gluing it down, I cut a small pocket in the seat foam for the little black box to press into. Here it almost looks like a reflection. I used an X-acto knife and just plucked the middle out. Is it needed? I don't know. Probably not. 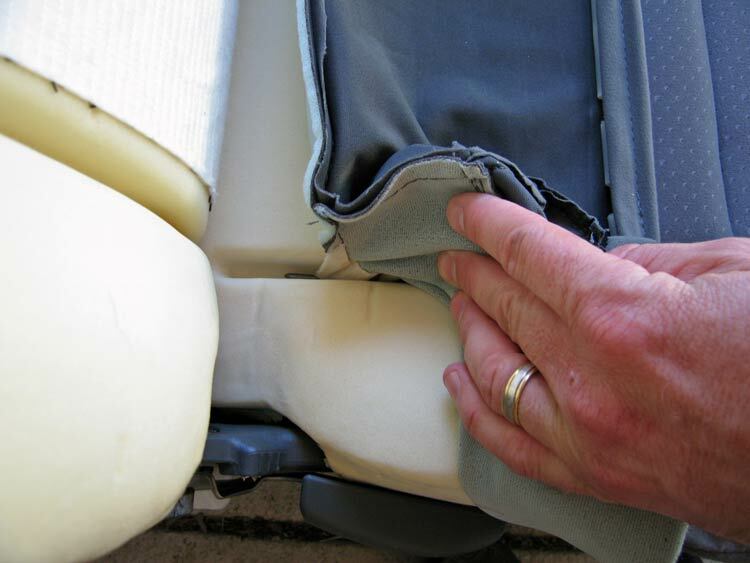 Trying to remove the plastic seat side-panel. There is one connection right behind where the arrow points, that is seemingly impossible to remove. In the end, I broke the clip, and recommend others do the same. That thing is not needed since there is a screw right behind it that holds everything in place just fine. If you can figure out how to undo this clip, all the power to you! 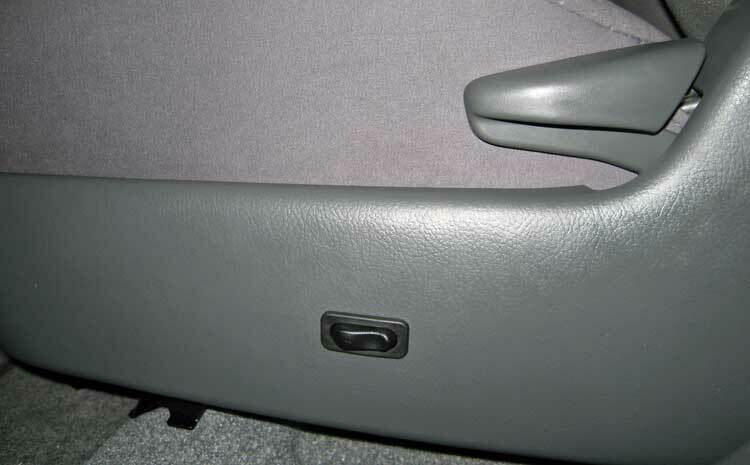 Here is that same area of the impossible clip, but with the seat upside-down and the cover off. Arrow points to the broken-off clip, which is STILL in the hole! Even after breaking it and removing the side cover, I still could not extract it with a screwdriver and pliers pulling directly on it! It'll stay there for the duration as a warning to other clips that may try to mess with me in the future. 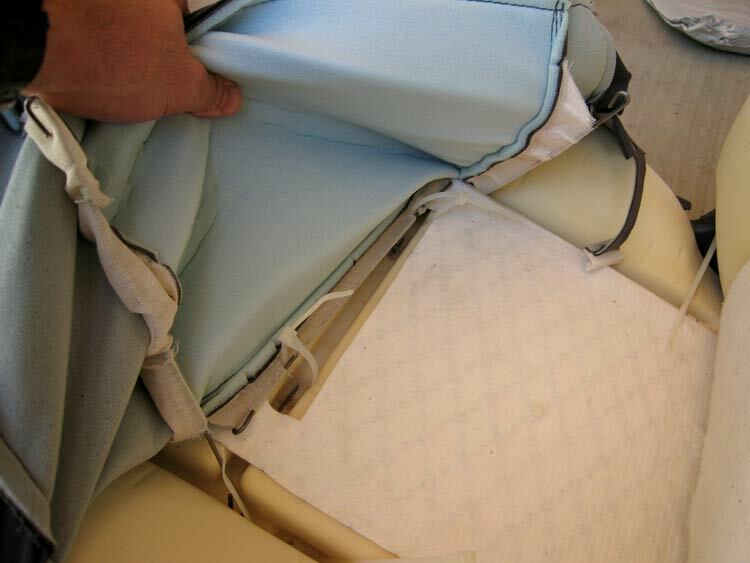 Also shown here is a tab from the seat bottom that pulls around and clips to the metal frame. There are several of these little buggers that you have to remember to *undo* and then again to *redo* when you are done. 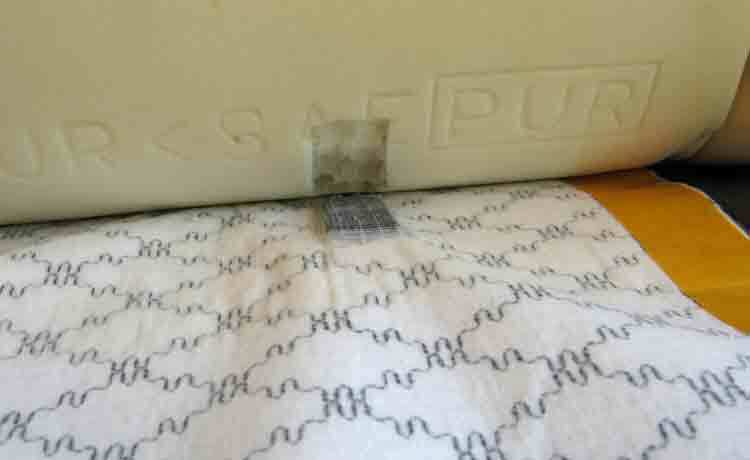 Here is another one of those tabs that comes from the seat bottom. This one is held in with a hog ring through the bottom of the seat foam. I replaced all of these with zip ties during reassembly. As the seat bottom comes off, there are plenty of hog rings to keep you busy. I just clipped them with wire cutters, and removed the pieces with needle-nosed pliers. I used zip-ties to put everything back together. Shown here is the first one you come to. Here I have both heater pads glued in place (hey. only one wrinkle!) 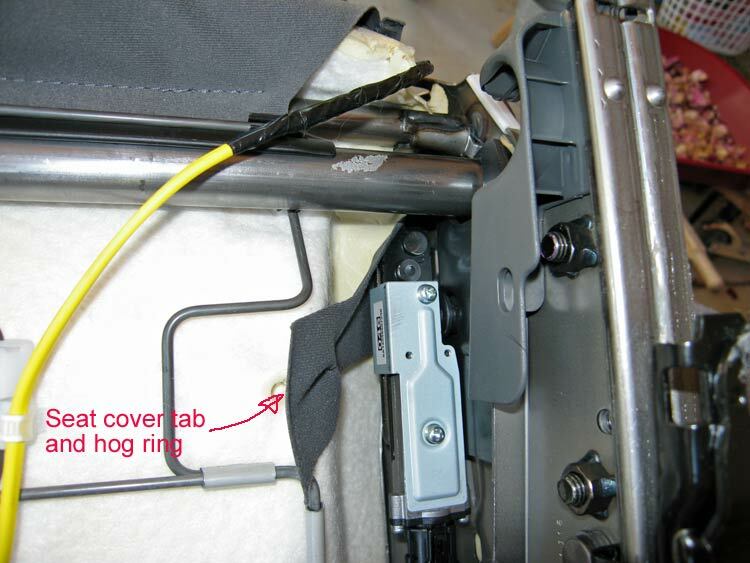 with a notch cut in the bottom one for the securing wire that is hog ringed down into the seat cushion. Putting the seat bottom back together with zip-ties in place of the hog-rings. 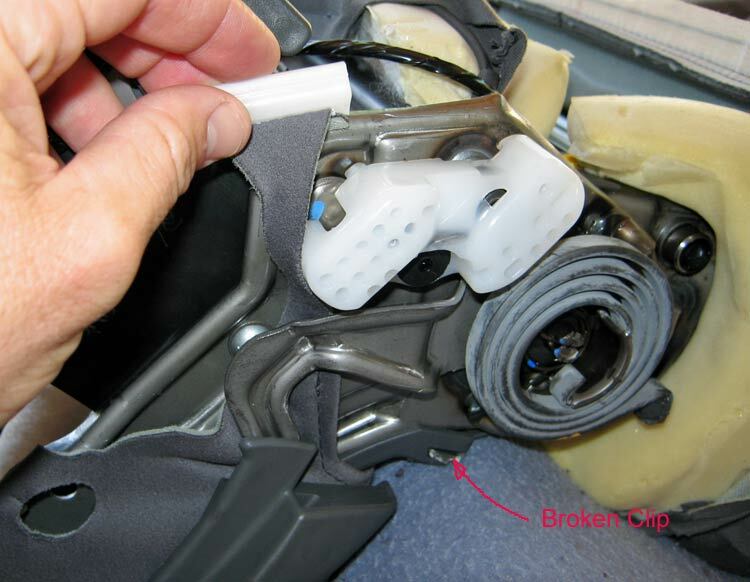 Shown here is the notch in the heating pad to allow for these connections. And the end result is that this is all you have to show for the trouble. While I'm thinking of the console, here are the tips for getting in there: Pull up on the shiny front edge (shown here) with your hands. The two cup holders will come off, and expose the two screws at the bottom. 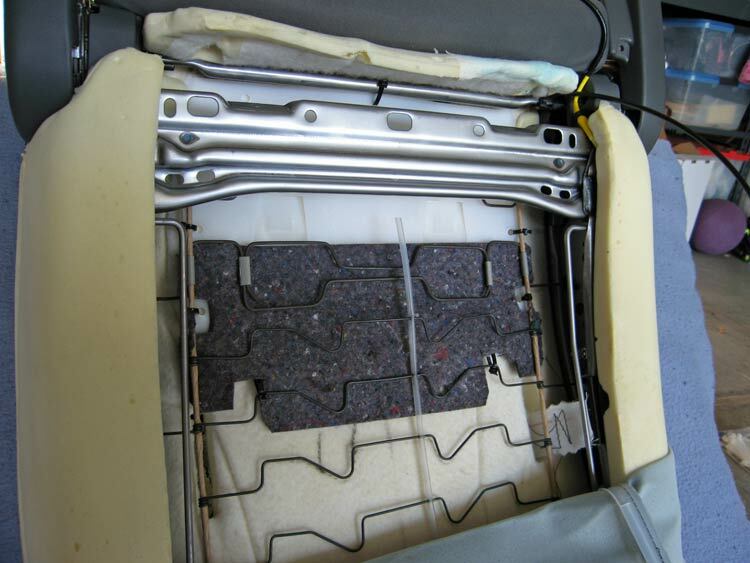 Remove the screws, then from inside the console, pull up the rug (just sitting there) and expose the two 10mm bolts at the rear. With those removed, the entire console comes off. Tilt it BACK, and struggle with getting the two harnesses unclipped. Then the whole thing will be free. Put it somewhere where it won't get scratched. First I tucked the bladder into position (tested the height with the seat out and the pump hooked up to a 12V power supply). I found it was easiest to tuck the bag in from the direction my hand is shown. The bag is fully in place here, behind the felt pad and springs. I removed the felt pad to have better access to the zip-ties. I used black ties to the seat springs. Good to have lots of extra ties so you can cut them and reposition plenty of times... like I did! Everything back in place, and some notches cut in the felt because the zip-tie interference. With the bladder in place, it is time for the switch. With the side-panel still off from the heater project, I cut a hole where I wanted the switch to be. I used a hot-knife, followed by a utility knife to clean it up. And now the wiring begins. First order of business is to get +12V back to the seats. There is power in the console, but I thought it would be better to take it straight off the battery, and not force it to compete with any draw from the outlet. 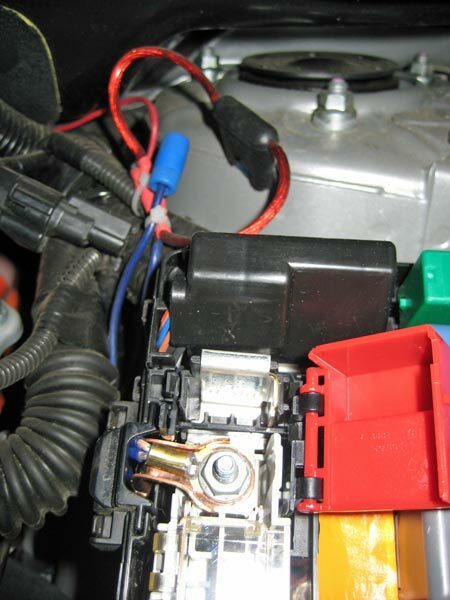 I soldered an eye on the end of a fat wire and bolted it to the prescribed "jump start" stub in the fuse box to the right of the engine. Wire exists out of the bottom of the box and passes through one of the included inline fuse holders (normally tucked down, but pulled up here to show). I also pulled a second wire (blue) and stubbed it off for later use. 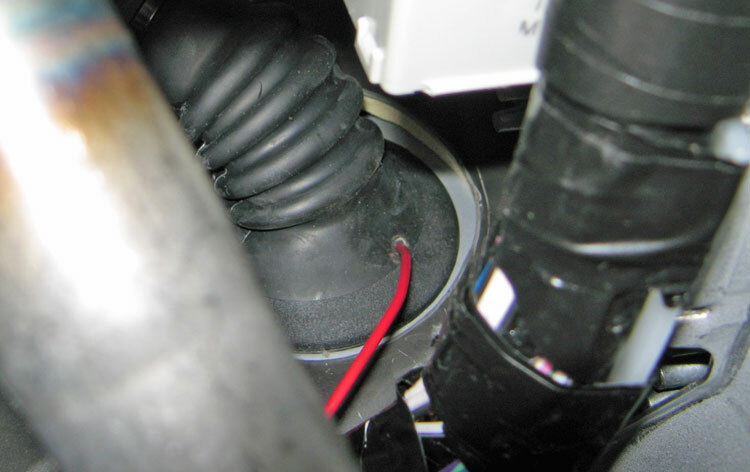 I then passed the wire through the huge wire grommet in the firewall. Hard to see in there, but follow that red wire back to the black grommet in the firewall. That's where I poked through. Here is my new bright red wire along the door sill, and poking through the giant grommet above/between the throttle and brake. 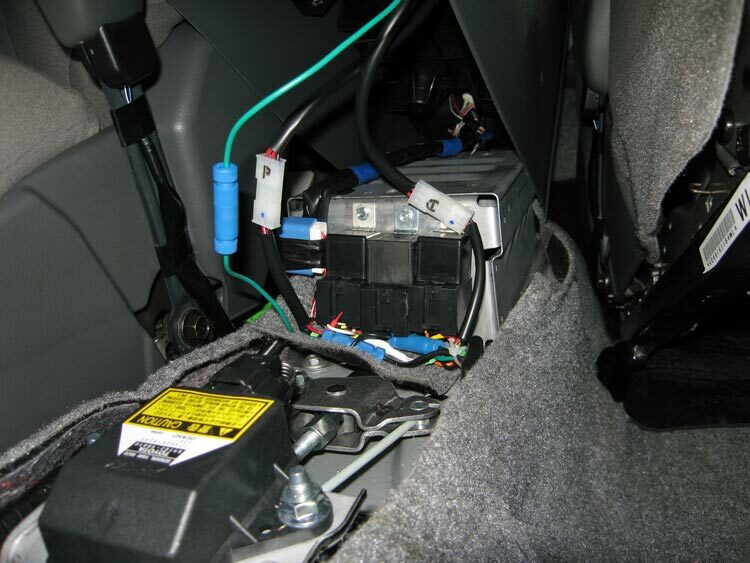 That red power wire is brought under the carpet to the center console where it is distributed as needed. 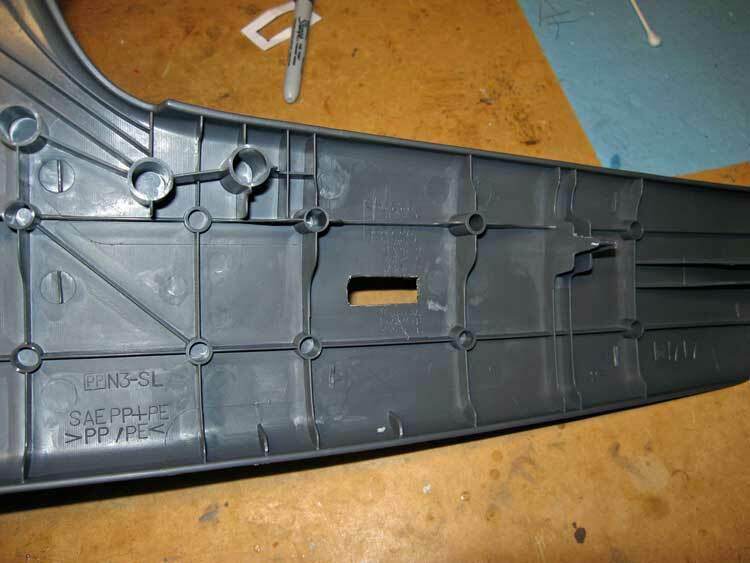 All major connections are done under the center console. Shown here are the three relays screwed to the mysterious silver box that is found under the console. Maybe this is where they keep the "black box" flight recorder??? All power for the heaters and lumbar pump come through the middle relay. The side relays control the heaters in each seat. 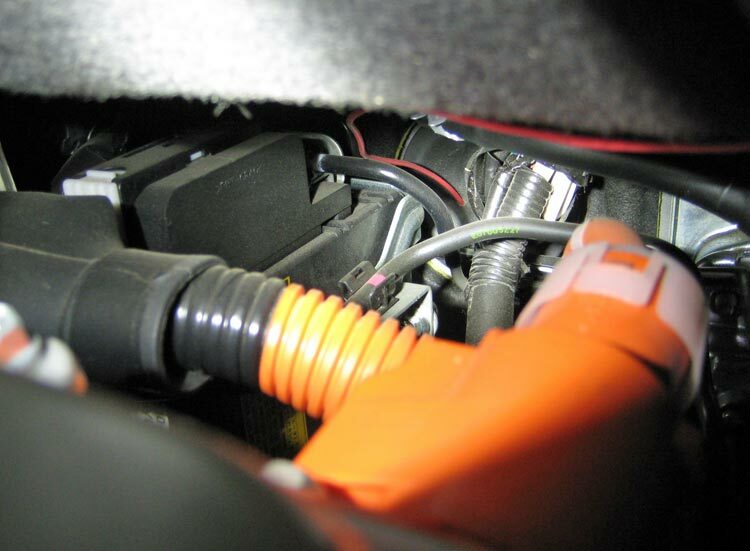 The trigger to allow everything to happen is the ig-switched power to the console 12V outlet. 1. 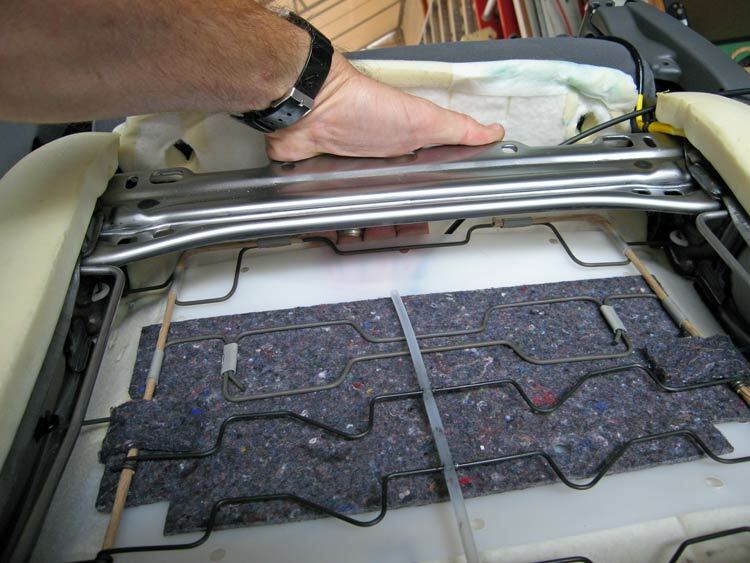 Open console lid and remove the rug on the floor of the thing (just pulls out). 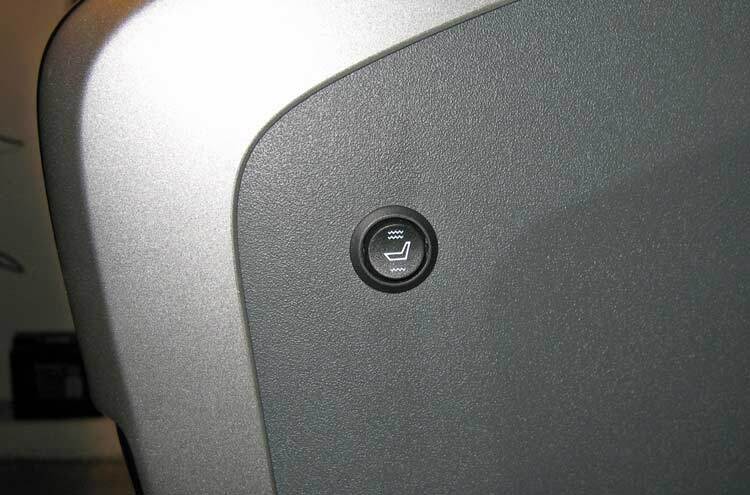 Remove the two screws at the bottom that you just exposed. 2. Remove cup holder trim from the front of the console by just pulling it off the clips. 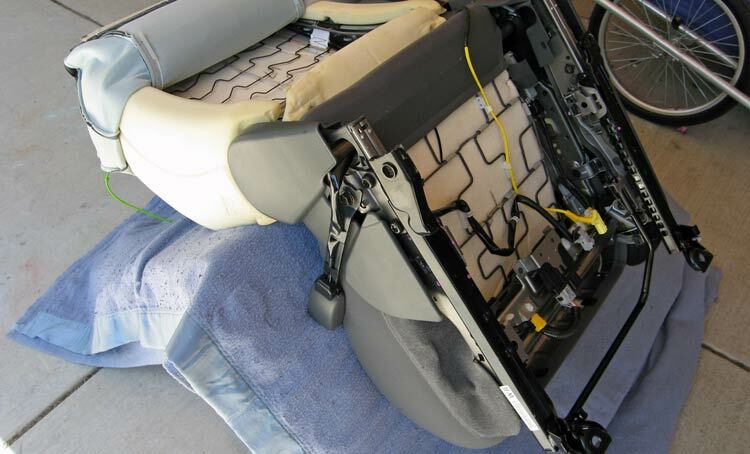 Remove two screws from the FRONT lower sides of the console that are now exposed - down near the floor at an angle. 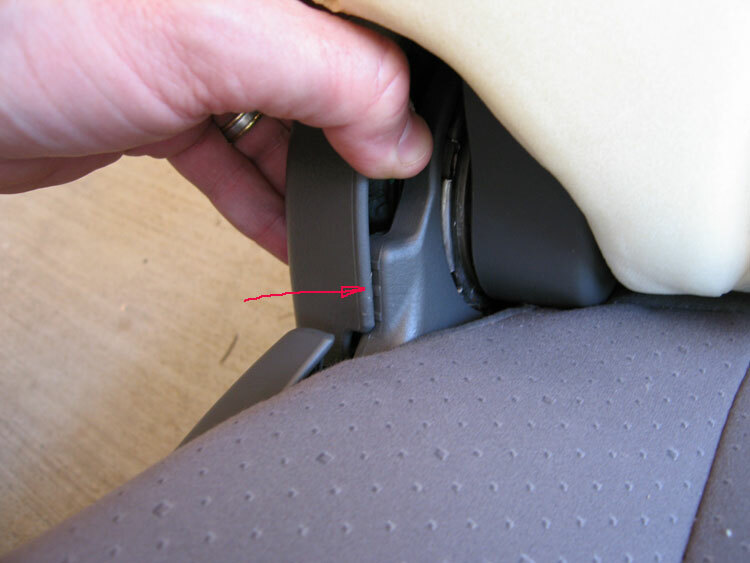 Don't remove the screws on the side (in the middle of the console) that are difficult to get to because the seats are in the way. Those only hold the shelf in the console. 3. Console is now free. Tilt whole console back. It will still be attached by all the wires in the rear of the thing for power, audio, etc. 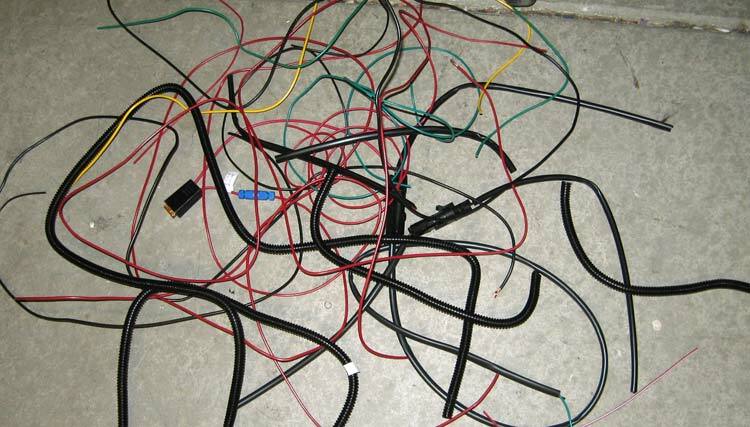 Just some of the "extra" wires and connectors after the harness reconfiguration. This is probably half of what I didn't use. 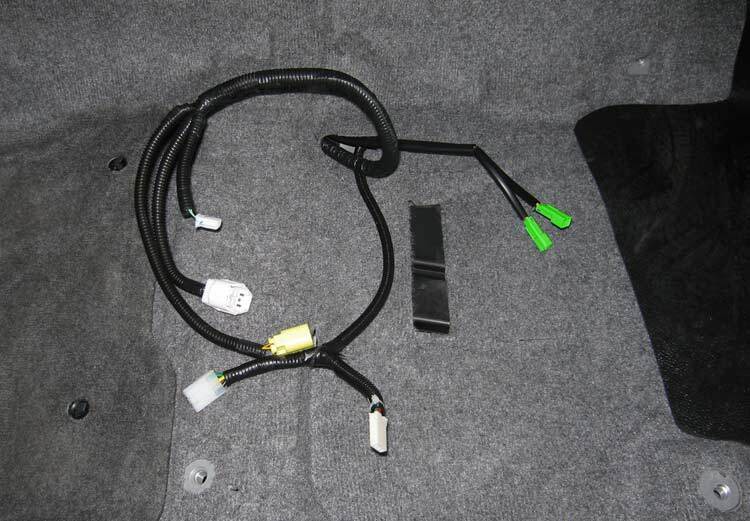 All the connectors for the driver seat. Two white in the foreground are the lumbar power and switch connectors. The two green ones are for the heaters. What it looks like when it is all done! We finally took an extended trip (1500 miles) where I got to enjoy my labors. Driving four straight hours was actually *comfortable* with the adjustable support. I found that there is no one perfect setting. Being able to change it ever half hour or so made all the difference in my comfort. I'm VERY happy with these mods!